Posted by Michael Reedy on November 8, 2018 in Sports, Volleyball. 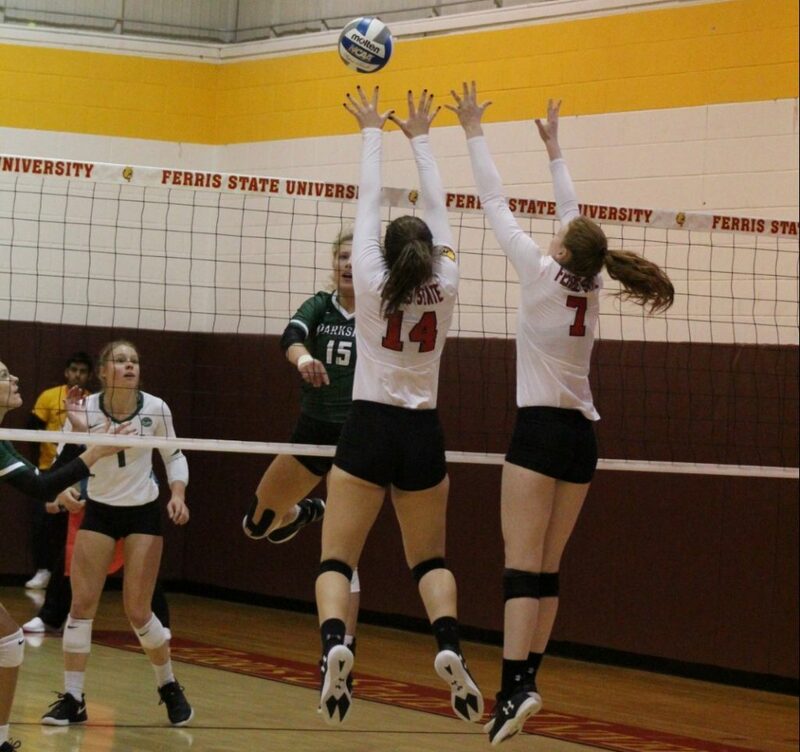 The sixth nationally-ranked Ferris volleyball team kept their hopes of a fifth-straight Great Lakes Intercollegiate Athletic Conference (GLIAC) tournament title alive with a 3-0 sweep of the University of Wisconsin-Parkside (UWP). Ferris entered the Wednesday, Nov. 7, matchup as the overall No. 1 seed in the GLIAC tournament, where they faced off against eighth seeded UWP. The tension of the match never ran high, as the Bulldogs won in three straight sets all by 10-plus points behind dominating performances from Ferris junior middle hitter Mekayla Carey and Ferris sophomore outside hitter Katie O’Connell, who both had team highs of 11 kills. The first set started out slow for the Bulldogs, as they held a 6-9 lead before Ferris senior outside hitter Kayla Rosman was subbed in and went on a roll, posting four service aces. Ferris would get the next nine points, extending their lead to 6-19 and eventually winning the set 25-14, the closet set of the night. The second and third set were not any different than the first, as Ferris would take the lead and win the second set 25-10 after they scored a quick six points to start off. The Bulldogs go off to a 6-6 set score to begin the third set then went on to win the final set 25-13. Ferris improves to 24-4 on the year and will now host the GLIAC tournament semifinals. The Bulldogs’ semifinal match is set for 3 p.m. Friday, Nov. 9, against Saginaw Valley State University inside Ewigleben Sports Complex.